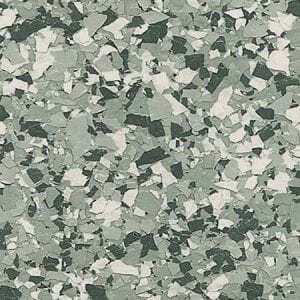 SureCrete’s floor flake chips for garage floor coatings and high traffic commercial flooring that requires a durable slip-resistant performance concrete coating. Available in 12 standard colors with options of custom color blends. 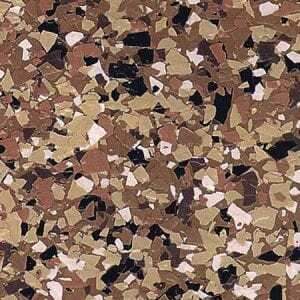 Best 1/4″ color chips for garage floors when using floor coatings. 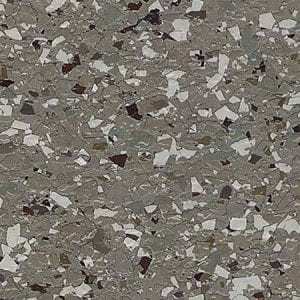 Dura-Kote epoxy floor flake chips system creates a vibrant, seamless, resilient surface from plain gray concrete. Although the system is simple both in composition and installation, it yields an exceptionally durable and long lasting floor. 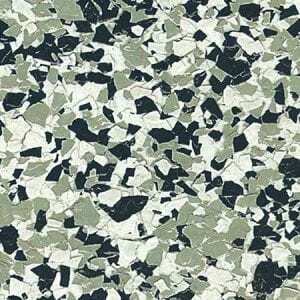 This epoxy flake floor system is composed of a binder, one of the Dura-Kote Epoxies and Dura-Kote Flakes, randomly shaped polymer chips, available in 12 color options. The polymer chips provide not only the pleasing palette of color but also add a measure of slip resistance to the surface. Dura-Kote Epoxy provides the structure and strength of the system. 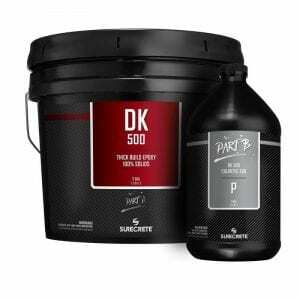 Due to these properties, the Dura-Kote Flakes epoxy flake floor system is used for garage floors, commercial kitchens, locker rooms, sports venues, automotive showrooms, veterinarian clinics, laundromats, or anywhere that an exceedingly resilient floor is required. 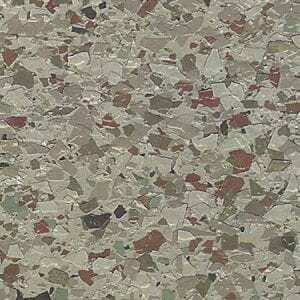 Dura-Kote Epoxy epoxy flake floor, also known as decorative vinyl color chips, flakes or flick are formulated paint aggregates for use in right combination with SureCrete’s garage floor epoxy with flake chip shaving systems are used to enhance the aesthetic qualities of seamless, resin-based flake chip floor coatings. This incredibly unique product is random in shape, but sized within a standardized range and pre-blended into a broad and rich variety of colors and palettes. 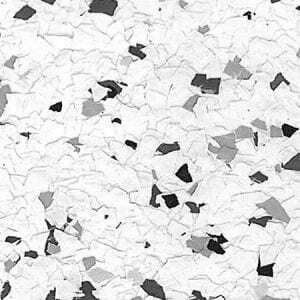 Epoxy Flake systems continue to gain immense popularity among architects, designers, contractors and consumers, due to their unique properties that deliver complete customization to commercial, residential garage coating, retail and industrial floors with an endless array of color styles, textures, sizes and blending options. The relative ease with which Epoxy Flake coatings are applied allows for this system to be implemented, not just by seasoned professional decorative contractors, but also homeowners and DIY weekend warriors. Any surface that is about to be sealed needs to be completely cured, clean and free of all contaminants, and fully profiled and etched. 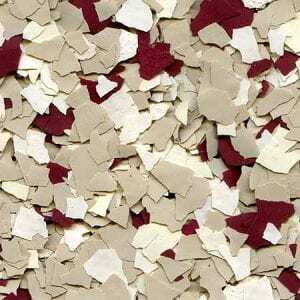 Moisture should also be limited as all Dura-Kote Flakes systems utilize non-vapor-permeable sealers. Based on the color chips and design selected from the Epoxy Flakes Color Chart, apply the pigmented binder coating of your choice, either Pigmented Epoxy 100, Pigmented epoxy WB or Pigmented PFC-180 (see specific products for more detailed instructions of application). 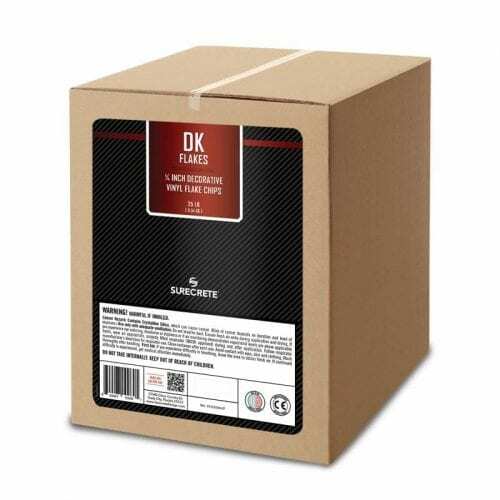 Roll out your binder garage floor epoxy just like you would floor paint, while still wet, broadcast the Dura-Kote Epoxy Flakes onto the surface at your desired delivery rate and design pattern. Allow the floor to dry and cure sufficiently, usually 8-10 hours, depending on temperature. 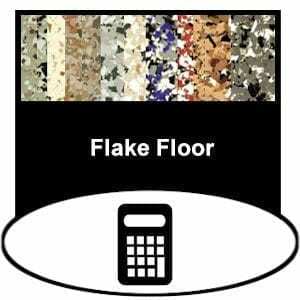 Scrape floor vigorously to remove excess Dura-Kote Flakes, then use a push broom to clean up and residual flakes on the surface. At this point, a finish coat may be applied. We suggest the use of a Polyurethane or Polyaspartic. 16-30 hours after second coat is applied, the surface is ready for light use, and is cured after 5-14 days depending on environmental conditions. 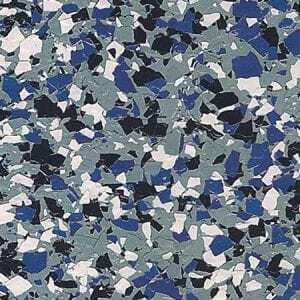 Question: Which sealers can I use in conjunction with Garage Paint Epoxy Flake Floor? 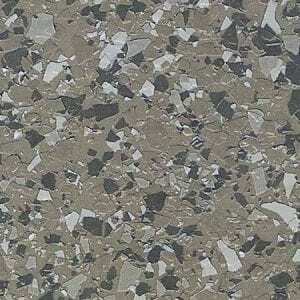 Answer: It can be applied using either Pigmented PFC-180, Colored Epoxy 100 and Pigmented Epoxy Water Based. 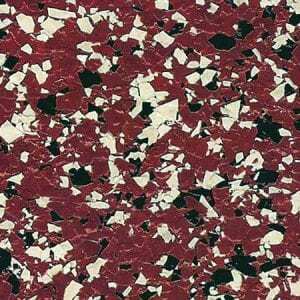 Question: Do I have to use the specified base coat paint epoxy color on the Epoxy Flake Floor Color Chart? 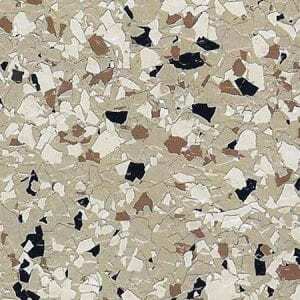 Answer: Not necessarily, but in order to get the same finished floor shown, that’s the color you’ll need to use. Question: Do I have to saturate the garage floor epoxy floor with Epoxy Flakes? Answer: Not at all! This is completely up to your own design needs. If you want to show more of your base epoxy colored coating, that’s your decision! 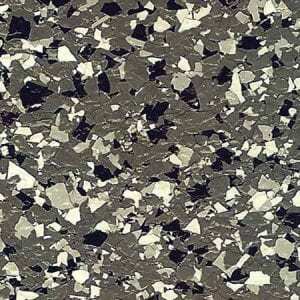 Dura-Kote Epoxy Flake Chips specs and properties are shared with the specific sealers used to apply them. Chimney 1/4 Inch 25 lb., Cosmos 1/4 Inch 25 lb., Smoke 1/4 Inch 25 lb., Gravel 1/4 Inch 25 lb., Sierra 1/4 Inch 25 lb., Durango 1/4 Inch 25 lb., Buckskin 1/4 Inch 25 lb., Asphalt 1/4 Inch 25 lb., Nevada 1/4 Inch 25 lb., Prairie 1/4 Inch 25 lb., Wrangler 1/4 Inch 25 lb., Savannah 1/4 Inch 25 lb., Special Order 1/4 Inch 25 lb. 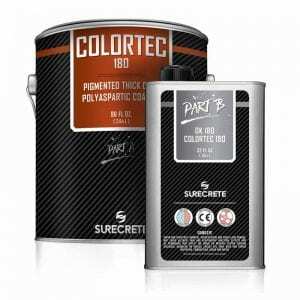 SureCrete’s floor flake chips for garage floor coatings and high traffic commercial flooring that requires a durable slip-resistant performance concrete coating. Available in 12 standard colors with options of custom color blends.